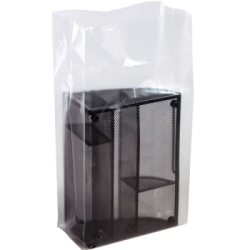 1.5 mil x 6" x 4" x 15" Gusset Bags | U.S. Plastic Corp.
Each of our gusseted poly bags are made of 100% virgin Low Density. Polyethylene (LDPE) resin that meets FDA/USDA specifications. Side gussets expand easily to fit over bulky or irregular size objects. Tubular construction with a durable bottom seal, make these bags the best on the market. Features superior clarity for showing the quality of your products. All listed gauges are nominal. Can be heat sealed, tied, stapled or taped shut.